So I’m sure many of you saw this week’s episode of Agents of S.H.I.E.L.D – the one with the opening of a courier carrying a briefcase of diamonds handcuffed to his wrist? Who gets killed and his hand ripped off at the wrist to free the briefcase of gems? Seems awfully familiar. 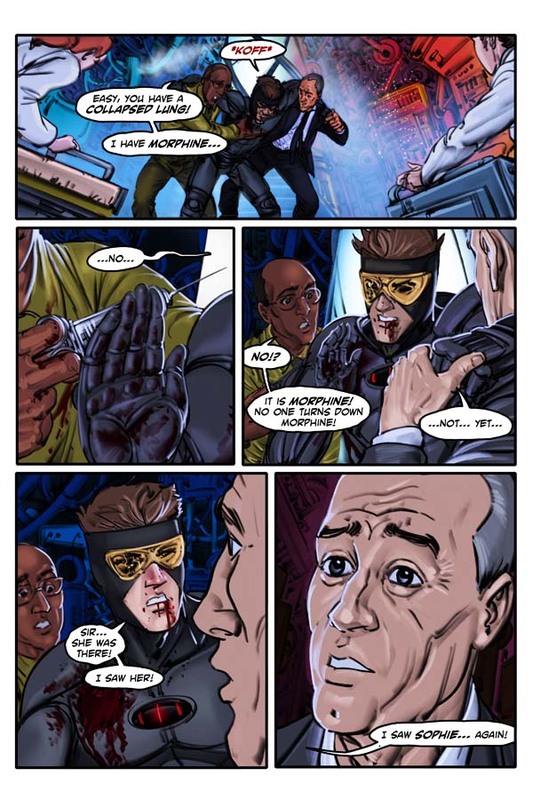 Not that I am accusing Marvel of heisting an idea from an ex-employee’s webcomic. In fact, I believe that the concept of hacking off the hand to get at the briefcase is a fairly common trope; a way to show ruthlessness in the villain and increase the shock value for the audience. In most cases it would be easier and less messy to cut the chain; a pair of cutting pliers would do the job, and would fit in the pocket as easily as any axe or serrated knife. Truth to tell, I believe that when I wrote the Fynch script I called for Roland to actually shoot the briefcase chain and snap it. Because I am a gentle soul. You may have noticed. Saint Bob of Chatsworth, they call me around here. It was my bloodthirsty son who decided to blow the guard’s hand off, and who seems to delight in just shredding hell out of our hero in every adventure. Raised right, he was. You will forgive a father’s quiet pride. Nonetheless, given the similarity of our respective openings, I am damn glad ours went up first. Because while no one would accuse Marvel of ripping us off, you can be sure the same courtesy would not be extended in reverse. Coincidences happen, but if the S.H.I.E.L.D opening and ours had happened in the same week, or even on the same day, somebody would be claiming we lifted it, even if there was no way the page could have been done in time. But ours went up first, so we’re in the clear. I prefer to simply believe that great minds think alike. Joss, baby! Call me. We’ll do tea and dumplings. Another one of those minor mishaps. Trying to shoot a Debris Blast effect ends up with the camera getting knocked askew. I guess I qualify for that, then. I did and don’t regret it. Ooo. A quick Googling shows you are right — but that it is often still administered for pain anyway while they effect repairs. Good catch though! Fortunately, Max turned it down.